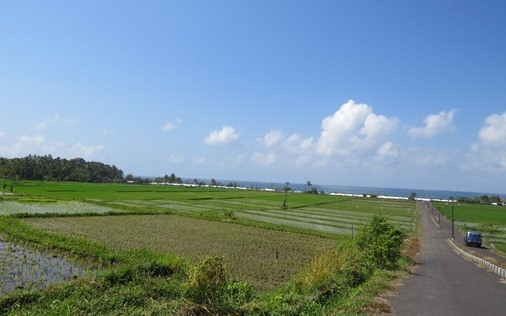 Situated on top of a cliff on the beachfront edge, Pura Rambut Siwi offers an exoctic views of the Hindia Blue Ocean and surrounded by vast rice fields on the mainland. 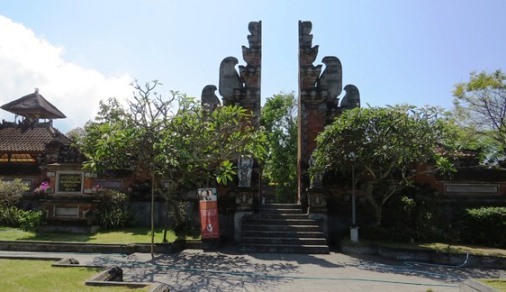 This temple is playing a role as the entrance to the nature of Bali. The ancient manuscript mentions about this sacred temple which has holds such a high spiritual value. The temple is situated in Yeh Embang Kangin Village, in the District of Mendoyo, Jembrana Regency, Bali. Visitor can access this amazing temple directly from Ngurah Rai International Airport, about 88 Kilometers (3 hours ). Let's take a closer look to the Rambut Siwi Bali! The history of Rambut Siwi Temple is mentioned in the ancient manuscript. This manuscripts are "The Journey of Maharsi Markandeya" and "The Dwijendra Tattwa". Ida Maharsi Markandeya start his journey from Java to Bali through the beach. 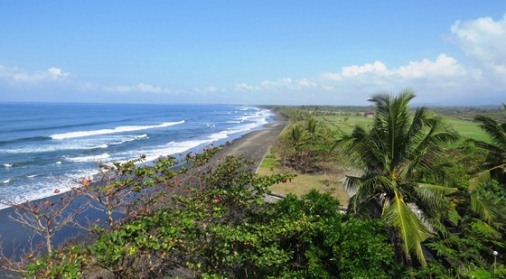 This beach is the location of Pura Rambut Siwi which people known afterward. After Ida Maharsi Markandeya arriving at this beautiful place, he settled some time and do meditation to invoke clues from Sang Hyang Jagatnata (The Universe). After meditating he received the guidance to make the protector in the west coast of Bali so that nature can provide safety for people who have been allowed to enter the realm of Bali. Then the priest continued his meditation to the God Vishnu (Dewa Wisnu) and God Varuna (Dewa Baruna) related to the guidance of Sang Hyang Jagatnata. Finally, the God blessed his meditation and granted a seaweed mesh nets that shine like a flame along the sea on the west coast of Bali. If someone were allowed into the realm of Bali then the seaweed nets will come down to the seabed so the sea can be passed by those person. From this miracle, Ida Maharsi Markadeya named this place "Rambut Siwi" which means the woven of seaweed and shaped like a hair. Furthermore Ida Maharsi Markadeya is given a new name "Sanghyang Baruna Gni" and sea on the coast of west Bali is called Dalem Segara Geni. The ancient manuscript "Dwijendra Tattwa" mentions about Dang Hyang Nirarta journey from East Java to the Gelgel Kingdom in Bali. On his way he passed through several places, interact with people until he arrive in the kingdom. After staying long enough in the Gelgel, he requested a permission to the King of Gelgel Dalem Waturenggong to do a journey and look directly to the public related to religious development in the villages. After got permission, he departed to the west and arrived in the area of Jembrana. The priest arrived at a temple and were greeted by the temple guard. Dang Hyang Nirarta is asked to conduct worship in the temple to invoke safety before continuing the trip. The guard requests many times by the tone in his voice and finally made the holy priest followed his request. Then the priest prepare and perform concentration to pray. There was a strange incident, the temple become broken and collapsed. The guard was very surprised, panic and immediately begged forgiveness for his mistake. The guards also begged Dang Hyang Nirarta to restore the temple as before. After the incident, the priest ask the guard not to do "such a thing" to other people. The Temple which have been damaged is restored to its original shape by the priest. Finally he gave few strands of his hair as a sign of protection and safety in those village. The hair is sacred and respected by the villagers as a sign of protection and furthermore known as Rambut Siwi which means " The hair which is sacred and respected". There are also several temples around this amazing temple such as Pura Goa Tirta, Pura Melanting, Pura Gading Wani, and Pura Ratu Gede Dalem Peed. Pura Gading Wani Rambut Siwi is located in southwest of the Pura Penataran Agung Rambut Siwi. The temple is a "pesimpangan" temple of Ida Betara that worshiped in Pura Gading Wani in Lalanglinggah Village, Selemadeg, Tabanan. In the temple of Gading Wani at Lalanglinggah Village there is also stana of Dang Hyang Nirartha. This is a symbol of respect for his service to eliminate the plague in the village of Gading Wani when Dang Hyang Nirarta arriving in Bali. 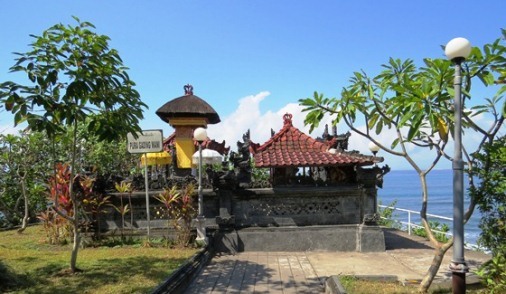 Rambut Siwi Temple Bali is situated on top of a cliff on the beachfront edge. This sacred temple offers an exoctic views of the Hindia Blue Ocean and surrounded by vast rice fields on the mainland. This temple is playing a role as the entrance to the nature of Bali. Located in the coast area of Mendoyo, the temple and its surrounding is influenced by Wet Region Climate or B type climate (based on Schmidt-Ferguson climate classification maps) . Very Wet Region Climate in this area has humid season which begin from November continues until May (7 months). Due to this climate type has quite long rainy season, the water flows throughout the year. The water flows through the river continues into the irrigation channels end up in the rice field. The soil in this area is suitable for agricultural because of the soils which derived from Palasari Formation. About 350 meters northern of the temple there is Pura Pesanggrahan Rambut Siwi. It's located just off the highway Gilimanuk-Denpasar, many driver and visitor stopped a while to perform worship, pray for safety in travel. The priest sprinkle the tirta to visitors and their vehicles. Visitors can get supplies for prayer (canang) or flowers at this location. The visitor who likely to take a rest for a while, there are a row of foodstall across the road provided for them. While enjoy a cup of coffee they can order the food or other menu. Rich in history combined with an exotic view of Hindia Blue Ocean, and encircled by the vast rice terrace. Such an incredible place and worth visiting! Take your time to travel to Rambut Siwi Bali. Hopefully helpful and thank you.